At a press conference Saturday, embattled Virginia Gov. Ralph Northam said that he is not either of the people in the racist yearbook photo that surfaced on Friday, but admitted that he darkened his skin for a dance contest in San Antonio that same year to imitate Michael Jackson. Catch up quick: In a statement Friday, Northam admitted to appearing in the photo, which depicts two people wearing blackface and Ku Klux Klan attire. At his press conference, Northam said he only did so after being presented with the evidence and determining that was the most likely explanation. He then said that after reflecting with his family and classmates at the times, he became certain that he is not in the photo. 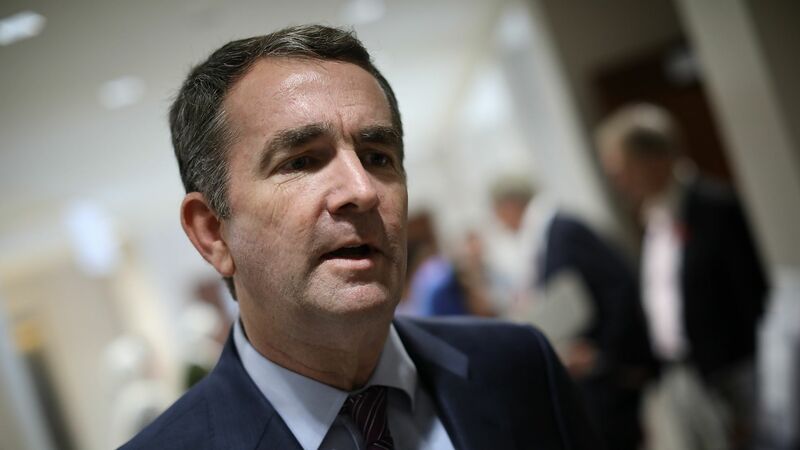 Northam claimed that he spoke with classmates who said that on numerous occasions, photos were incorrectly posted on the wrong yearbook page, and that he believes that's what happened in this situation. What they're saying: After the press conference, the Virginia Legislative Black Caucus and the Congressional Black Caucus both doubled down on their calls for Northam to resign. In his first statement since the yearbook photo emerged, Lt. Gov. Justin Fairfax, the second African-American ever elected to statewide office in Virginia, did not call for Northam's resignation. Later on Saturday, Sen. Tim Kaine, Sen. Mark Warner and Rep. Bobby Scott issued a joint statement calling for Northam's resignation. They joined with Attorney General Mark Herring as the state's high-profile Democrats to ask Northam to step down. On why Northam admitted he was in the photo Friday night: "I take credit for recognizing that this was a horrific photo that was on my page, with my name, Ralph Northam, above. I looked at it. My first impression, actually, this couldn't be me. But there was so much hurt that I was feeling, people were calling. So I reached out and apologized to people for this very picture being on my page. And I have continued to discuss that as we have gone forward. And what has happened is that last night, I finally had a chance to sit down and look at the photograph in detail. It is definitely not me. I can tell by looking at it. I have had friends also look at it and tell me it's not me." On why people should believe him: "I'm accepting responsibility that this photograph was on my page in the yearbook, I regret that. It's horrific. It made me sick when I saw it. But I will tell you that my word, I will stand and live by my word. I was the president of the VMI honor court. Our code there is a cadet shall not lie, cheat, steal, or tolerate those who do. That's the most meaningful thing to me in my life. I tell the truth. I'm telling the truth today. That was not my picture." On the Michael Jackson costume: "I have a very close friend who was my assistant during the campaign. He really did a good job of communicating to me why that's so offensive. And it was actually during that conversation, I said, you know, Seth, I put some shoe polish on my face, I competed in a dance contest dressed up as Michael Jackson, and I said, I assume you probably would think that's offensive. He said, I would. And I said, you know what, Seth, I appreciate you being open with me, I apologize for what I've done in the past and I can promise you I'll never do that again in the future." On the nickname "coonman" that appeared in the yearbook: "My main nickname was Goose, because when my voice would change, it would change an octave. There were two individuals, as best I recollect. They were a year ahead of me, they called me — I don't know their motives or intent. I know who they are. That was the extent of it. This ended up in the yearbook and I regret that."